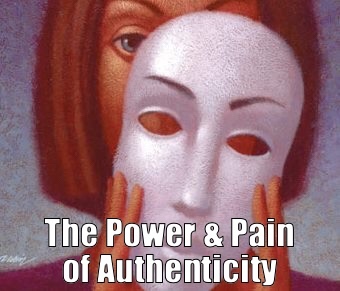 If I’m going to be authentic with people—who I am with nothing added—I will likely feel a fleshly urge to add some pizzazz or extra personality or something really good to say in order to enhance the result. Refraining from that urge can seem like I’m ignoring an opportunity that really ought to be filled. I was once very good at filling voids with jokes, sarcasm, nervous laughter or witticisms. But choosing now to be authentic means I’m resting and trusting in Christ and choosing life by the Spirit. And that’s different. When we’re born again, we are no longer of the flesh nor are we in the flesh, and life is by the Spirit. It’s all new. That means our primary awareness becomes God—with us and in us—and not our previous fascination with how to be or what to do in our days. The pressure is off. Life navigation used to be outward oriented; now it is inward. Our greatest prize and joy becomes knowing God—even when we’re with people—and trusting Him to produce in us and through us what He wants and would be to the people and situations that we find ourselves in. That’s fun. It’s invigorating, and allows for Christianity—life in Christ—to be the life it’s supposed to be. You know—out of this world. I think most of us are used to dressing up our behaviors and interactions with people. Do you know what I mean? The flesh sends us the message that we should enhance everything—you know, turn on the charm or turn on the gloom—whichever will give us better odds of getting what we want. And it might, actually, so that can become our goal in life. Right? Control yourself = Get what you want. In fact, if you do not enhance your interactions with people in the ways that others do and expect, they might view you as different or odd.“She’s not with the program”. But you’ll know better because you’ll be knowing Jesus. You’ll be led by the Spirit, and that’s where the excitement is, that’s where life is. In addition, Christian authenticity does not simply mean honesty, which can be brutal and harsh. Christian authenticity is living in and trusting in our union with Christ, while the Spirit manifests whatever fruit He wants for a given situation. Life by the Spirit for us means love from God and love for others, which comes forth from us as love, joy, peace, patience, kindness, goodness, gentleness, faithfulness and self-control. If we’re “just being honest,” that’s not necessarily Spirit-led; that could be fleshly. Plus, we miss out on knowing God in us. This doesn’t mean that you can’t just be yourself. On the contrary, this is how your authentic self is found on the inside with God and in union with Him. This is one way that you find both — through authenticity. Next PostNext WHAT IF YOU’RE GOOD?